Posted: Tue Jul 05, 2011 9:42 pm Post subject: Why oversized gauges? Why is it that the bushy community prefers them? Posted: Tue Jul 05, 2011 9:56 pm Post subject: Re: Why oversized gauges? I only have one Ashcroft gauge left on my markers and it's on one of my Desert Foxes. I just like it because it keeps the original look of the marker. That's probably one reason people do it. It keeps the OG feel of things. And then when you're talking about this forum, I think people who keep their ICD markers kicking after all these years prefer function over form. It doesn't matter what it looks like. All that matters is that it functions well. Ashcroft has probably been around longer than most paintball companies and will probably be around long after some. I got some crap microgauges on my Lasoya and some other aftermarket crap microgauges. It doesn't feel good having a gauge blowing even when you didn't overpressurize it. Lesson learned, don't buy 32 degrees gauges and don't trust those Lasoya stock gauges. But I do prefer those micros in the end only because they don't get in your line of sight as much. I even got one of those Invert uber micro gauges on my FS8 and it's held up fine(even though it's made in China). I'll recommend those. Also, since we're talking about gauges, has anyone had any experience with the Bob Long Gauges? I've been thinking of picking up a couple of those 0-160s for my Lasoya and 04 FS. Posted: Tue Jul 05, 2011 10:20 pm Post subject: Re: Why oversized gauges? That is what I figured. I just wanted to hear everyones input. I would trust the BL gauges. Mine has been around for quite a while, I would trust a higher rated gauge though. I personally would rather go overkill and be safe. Posted: Tue Jul 05, 2011 11:56 pm Post subject: Re: Why oversized gauges? I use them because they are the perfect size to wrap my thumb around when I play. It's a nice little finger cradle. Plus, I like the looks of them. 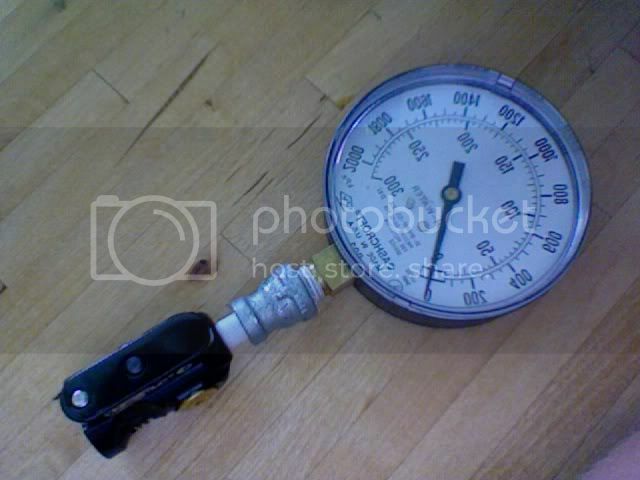 Posted: Wed Jul 06, 2011 1:13 am Post subject: Re: Why oversized gauges? eh, it could be a form over function aspect. with that, gauges are like electronics, they can fail at anytime. generally, the bigger the gauge, the better the performance, i.e. the bigger gauge will be more accurate and handle more over pressures, than the smaller micro gauge. i personally, don't put on a gauge if i can help it. if the gun/part had one, then i'll leave it off, but since i got my reg tester, i don't need a gauge on the gun. with the HPR and even the LPR testers, i will set up the reg before hand for the general pressure range, and just fine tune the gun over the chrono. Posted: Thu Jul 07, 2011 4:10 am Post subject: Re: Why oversized gauges? Posted: Thu Jul 07, 2011 10:28 am Post subject: Re: Why oversized gauges? Posted: Thu Jul 07, 2011 12:01 pm Post subject: Re: Why oversized gauges? Posted: Thu Jul 07, 2011 1:14 pm Post subject: Re: Why oversized gauges? That's the ubber rare reverse ashcroft! Posted: Sat Jul 09, 2011 9:33 pm Post subject: Re: Why oversized gauges?